It was the 'great Chucky movie' I saw recently. I've heard of it a whole lot from my friends! I had been jealous of them, because I actually have never seen a horror movie in my life. So last weekend, I watched the first Chucky movie together with my mom and dad. At first Chucky was an innocent doll like this, looking so innocent that at first I even thought this might not be a horror movie. This cute doll actually had a dreadful murderer's spirit inside it, and turned like this. "You aren't talking about me, are you?" This movie was made in the 1980s, and it seems a bit weird sometimes when Chucky moves. Nowadays Chucky would be able to move more realistic like many animations do. 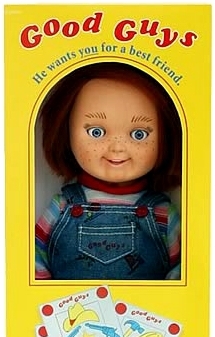 Still, it gives me a bit of chill when Chucky turns around and looks at me with his strange glassy eyes. I think Chucky's queer movements make him look terrifying. What made the movie scary? Point 1: Putting a 'doll' as a scary character made the movie spooky. The doll in the first picture looks like as if it did nothing wrong at all. Dolls are a symbol of purity, and they usually don't make us think of stuff like murder and ghosts. However, when those so innocent dolls move by themselves and make terrible faces, it's quite a bit frightening. Point 2: There weren't a lot of people who helped getting rid of Chucky. It was because no one believed the little boy who talked about his alive doll Chucky, unless they have experienced it. I can still remember the man saying at the very end, "Now I believe you, but who will believe me?" It's not easy to believe that there is a doll that can talk and walk. So why is this Chucky wandering around and killing people who did nothing to him? Chucky might say he wanted to revenge on the person who killed him, and he just took some bonus killing for fun. This makes me so angry. Killing innocent people just for fun always makes me angry. I was not that scared of Chucky because I was more angry than scared! I don't think Chucky is so horribly scary, but it had actually made a big sensation when it was released. It was about 30 years ago, and a moving doll might have been shocking at that time... Nowadays we are tougher than before. We are slowly becoming more and more numb from shocks. What would it be like in 30 years? We might get so careless about fear that there wouldn't even be a word called 'fear' or 'scare'! Well, Chucky has also made my mind become stronger, and it made my mind upgrade in a way. I guess that's at least one not-so-bad thing he did.